Create a kitchen or whip up a washroom with these no-fail design formulas and transform your house into your dream home, one room at a time. Tell us about the process that led you to decorating and being an author. I have always, always enjoyed interior design. On my blog, myroomrecipes.com, I talk about my first design project, my bedroom, when I was 8. My parents always let me decorate my bedroom and eventually relied on my direction for decorating the whole house. I had second thoughts about interior design when I was in college because I wasn’t sure if I’d be able to make a living at it. So, I got my undergraduate degree in public relations and got a “safe” 9-5 office job with a steady paycheck, benefits and a 401K. I was miserable! After getting married, I was able to go back to school and get my Master’s degree in Interior Design, and I have never looked back. It’s interesting how life works out because my degree in public relations, which requires a large amount of writing, came to benefit me when I was approached by my publisher, Cedar Fort, to write a book. Do you draw inspiration from any other cultures or influences? I draw inspiration from everything! People, places, things. My mind is constantly processing what I see, feel, and hear which eventually becomes part of my design. I grew up in the midwest (Minnesota and Oklahoma), so my style is a little bit different than most in Utah. My friends in Oklahoma are pretty eclectic and incorporate a lot of unique finds into their interiors. That’s why I wanted to include some spaces from my home state. Have any events, signing or store open houses coming up? Yes! Next Thursday, Oct. 10 from 6-8 pm, Main Street in Bountiful is hosting an event called Shop Local, Save the Girls. It’s a fundraiser event for breast cancer awareness. Our store, LIV Showroom, will specifically be holding my Room Recipes book launch and signing, a huge floor model sale, and, drumroll please, the Waffle Love truck will be in front of our store from 5-9 pm! Summer is my favorite season. I love the sun, heat and warmth! It’s a non-fussy time of year to decorate. Life is more laid-back. My home always feels open and clean. Guests casually come and go. Fall and Winter feel so suffocating. It’s cold. There’s pressure to decorate for Halloween, Thanksgiving and Christmas. I don’t like dragging temporary decor out and then having to clean it all up and put it away. So far, what has been the most rewarding part of being an author? Technically I’ve only been an author for a few weeks since my book has only been available since then! I’ve gotten some really nice comments and feedback via email and other book reviews, so that’s always nice. I’m glad people are able to find inspiration from my book. What recommendations would you give a first time home decorator? Use what you have, recycle, DIY and don’t get stressed out about it. Decorating should be fun and your space should reflect your personality. When I was in college, I decorated every apartment I lived in with hand-me-downs and DIY projects. I was creative with my limited budget. Design doesn’t have to be expensive and high-end. How do you balance writing, working and family life? Ugh! Good question! I’m still sorting that out. I’m very, very busy. We had the pleasure of hosting two teenage girls from England for three months while I wrote my book. They were able to assist with my boys, my house and even with projects in the book. My boys are a little older, so it’s a bit easier. My husband is super supportive of everything I do. Plus, I wake up at 5 am to get started on my day! 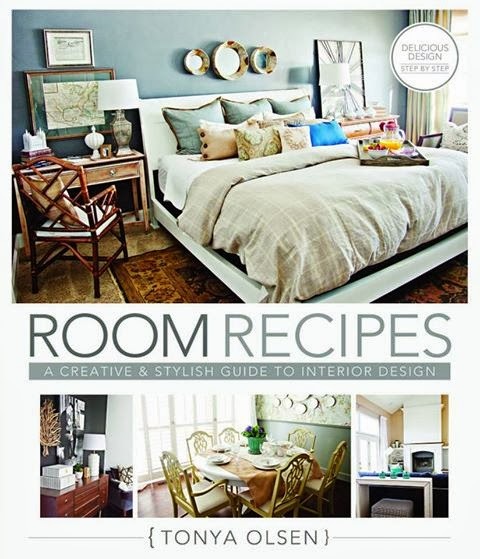 Meet the Author: Tonya Olsen has always had a passion for designing charming, budget-friendly rooms and projects. She loves to combine traditional interior design principles with personal, do-it-yourself flair. Tonya shares ownership of LIV Showroom, a full-service interior design firm and retail showroom, and holds a master’s degree in interior design. She is also the lead interior designer for Utah homebuilder, Rainey Homes. Tonya has over 20 years of professional design experience, bargain shopping fortitude, and do-it-yourself gumption. She spends her spare time gleaning inspiration from interior design books, magazines, blogs, and websites. Tonya and her husband have three boys and live in their recently renovated home in Bountiful, Utah. The Giveaway: One e copy of Room Recipes. To enter fill our the rafflecopter form below.